Click here for sample verses from the versions by Lew White. Comments: Softcover large octavo w/ adhesive binding, 1344 pp. Scripture texts in double column verse-wise. Few word- and other explanations in footnotes. Scripture texts start p. 43 and ends p. 1319. »The goal was to produce a translation from the Hebrew Masoretic Text and the Greek Textus Receptus to convey the purest restoration of the thoughts and original transliterations of names and places as is possible with the English language. (…) The scholars who came forward and were chosen for this new project all all Natsarim, or followers of Yahusha. (…) Formerly, translations have been made by men solely upon their knowledge of languages; their personal walk (obedience to the Word/Torah) or beliefs may have been influenced by one or another denominational vantage point, or possibly they had no personal love for the truth whatsoever. Also, this new project was performed by those who share a deep love for the Name of the Creator and His Name was restored to the text in its original ancient Hebrew form as He wrote it: (…).« – All the „names“ of God and his son, i. e. Yahua, Yahusha etc. 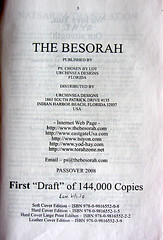 are explained in the 8 pp Preface; there are many more „prefaces“ prior to the Scripture text, some with illustrations. The names of God and his son are printed in „Paleo–Hebrew“. More appendixes at the end of book. Comments: Softcover large octavo w/ adhesive binding, 1220 & (4 empty–) pp. Scripture texts in double column verse-wise, starting p. 19, ending p. 1212. Prescript: »Text sources used in translation and transliteration: Masoretic Text without diacritical vowel / cantilation symbols [and] Greek Received Text. Transliteration revisions by Lew White. The text has been revised (compared to 1st ed. 2008), spelling of Biblical characters and locations changed in many instances. Birnbaum´s remark: These versions belong to the oddest Bibles i´ve ever come across. 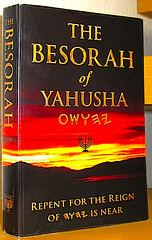 I have never heard of a saviour called ´Yahusha`, have never seen a so called Paleo–Hebrew tetragrammaton named ´Yahua` in a masoretic scroll or manuscript. Furthermore other new names are given: Yisharal (Israel), Daud (David), Ayub (Hiob), Yahukanon (John) etc. 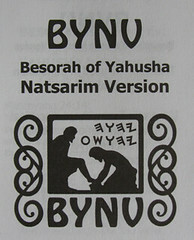 For more information see lapidjudaism.com, in a blog "Comparing and Reviewing Hebrew Roots Bible Translations".